At the beginning of March, following a visit to the World Council of Churches in Geneva, with brothers and young people, and before going on to Rome, Brother Alois, accompanied by two other brothers, made a stop in Cologne. 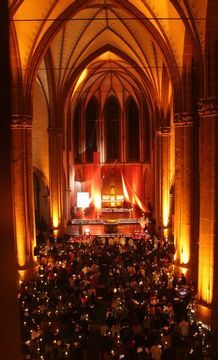 Brothers had already prayed in Saint Agnes Church during the 2005 WYD and during the 2006 “Kirchentag” (meeting of the German Protestant Churches). Each year many young adults from Cologne and the region come to Taizé and to the European meeting. Thus the visit was a beautiful sign of communion. 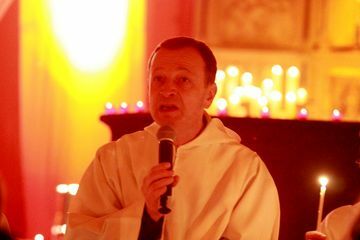 With the experience of regular prayers at Saint Agnes and the large prayer that takes place each year - called the "night of lights" - an with the support of many very committed young people, the church as well prepared and well filled for the prayer. See on line the prayer and the meeting with Brother Alois. At the end of the prayer, Brother Alois spoke of the meaning of Lent. Lent is a time for becoming more aware of the love of God and for rejoicing in his forgiveness. As we read in the Letter of Saint John: it is the love of God which pushes us to love our brothers and sisters and to express that love through acts of solidarity. …All of us can express our love for God, perhaps not with high sounding sentiments or extraordinary thoughts. But we can be silent and simply say to him: “You know that I love you, you know that I want to live from trusting in your presence”. … Solidarity among human beings and trust in God: these two values that I wanted to underline this evening are so important that you could take them with you. It would be good if all of us go further into them during the coming weeks. For some, could they not constitute a true project for their lives?